Is it too late to say Happy New Year? I haven’t connected with the Greenhouse blog since Christmas, so I feel like my year is just beginning now that I’m able to write again. Truth is, I’ve been buried under a huge DIY home project that we embarked on during the holidays. We busted up tile, rolled up old carpet and laid new laminate wood floors. Lots of it. The holidays came to an end but our project didn’t. So we’ve been completing the finishing touches in the evenings after work. Last week I nailed quarter rounds into the base boards until 10 pm each night while Gary was the master cutter at the saw. Thankfully, this is the first week in a month that we can finish supper without putting on knee pads and picking up a hammer. That’s why this week feels like the beginning of the year because life is finally returning to normal at the Greenhouse. I’m sitting in my favorite writing chair for the first time since mid December. And for the first time, our project isn’t making me feel guilty for sitting. No longer am I surrounded by old carpet that was frayed at the edges with vicious nails at junctions that waged war on our tender feet. Nor am I cleaning old tile that never looked clean. Now I’m surrounded by new, and it feels good. But the old stuff taught me some lessons on its way out. And “getting rid of the old” isn’t just important in a home makeover. It’s important in Christian transformation too. 1.TAKING OUT THE OLD IS NECESSARY. It’s so tempting to skip this step. Sometimes you can get away with it—I have a friend who painted over her old wallpaper and it looks great. But most of the time, the old has to go. Do you try to skip this step in your spiritual growth? Do you want better relationships, but you’re not willing to get out of some harmful relationships? Do you want to be more content without getting rid of your jealousy? Do you want more peace without taking the effort to get rid of your fears and anxieties? Do you want a better marriage without getting rid of your critical words or hurtful habits? Do you want to reconcile without letting go of the grudge? Do you try to add some extra kind words to gloss over the gossip? Or do you add humility in some areas to cover the pride in other places? What is some “old” that you need to get rid of before you put on the new? 2.TAKING OUT THE OLD IS HARD WORK. Once you’ve decided to get rid of the old, be prepared that it’s going to be hard work. I suppose that some things are easy—pulling up the carpet was a breeze. But getting rid of the tile was way harder than we expected. Our whole family was sore from the efforts. Our college boys pounded tile with sledge hammers for two solid days—a sure way to help them want to return to school. Then we spent another two days with a rented demolition power machine to remove the remaining tile residue. It was a huge mess with tile flying all directions. We had some bloody shins and I still have dust in the closets that reminds me of the effort it took to get rid of the old. Taking out the old is hard work in matters of the heart too. Old habits. Old attitudes. Old ways of thinking. Some will go easier than others. But it takes effort to look into the heart and remove what needs to go. There have been times that I needed to let go of a grudge but I preferred to gloss over it with a fake smile instead. Or I’ve acted happy for someone else’s success instead of facing my jealousy head on to get rid of it. It’s hard work—sledge hammer hard–to go deep enough to take out the old that needs to go. 3.TAKING OUT THE OLD IS WORTH IT. It’s necessary. It’s hard. But it’s oh so worth it. Getting rid of the old creates space for the new. My new floor looks great. But it’s nothing compared to a new self, new attitude, new life in Christ. It’s worth digging deep to get out the old that has taken root in the crevices of the heart to make space for the Spirit to renew and transform us into the image of our Creator. It will be a while before we take on another huge home improvement project, even though I have some wall paper that is curling at the edges just begging for attention. Whenever I do get around to it, I’ll know that it’s necessary to take out the old, it’s going to be hard work (probably harder than putting on the new), but it will be worth it. 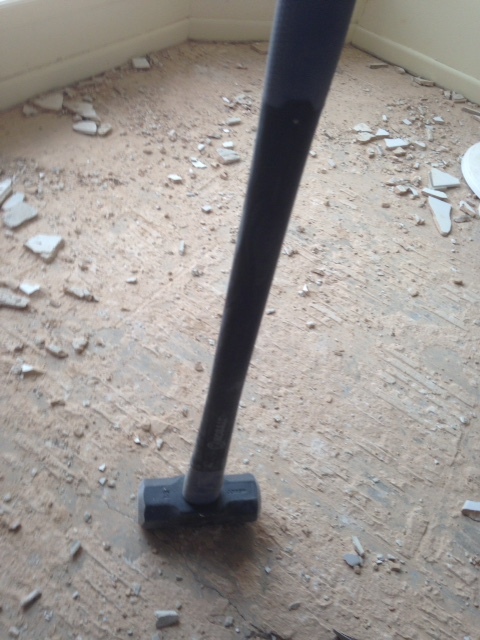 May you have sledge hammer strength to get rid of some old as you enjoy a new year of putting on some new.